Things moved quickly yesterday. By 6.30 in the evening, Fairfax Media chief executive Greg Hywood had confirmed a $2.2 billion takeover bid by US leveraged buy-out group, TPG Capital. The crew from TPG are asset traders, they are not there for the journalism. In 2006, TPG bought Myer for $1.4 billion (their input was $450 million), sold the flagship Melbourne store for $425 million, stripped out the cash, loaded Myer up with debt, floated it on the stock market and turned $450 million into $2 billion in three years. The piece de resistance? When the Tax Office came after them for $678 million and tried to freeze TPG’s accounts it was too late. They had siphoned it offshore. TPG’s bid for Fairfax is complex and conditional. Yet the historic Australian media house is now “in play”. Its investment bankers will be running about trying to tee up a rival offer, get an auction going. Meanwhile, striking journalists at the Sydney Morning Herald and The Age – and a few from the Australian Financial Review – are unprotected. Fairfax is playing chicken. It has not taken them to the Fair Work Commission. This is now a deadly game of bluff between management and journalists risking their redundancy packages, their financial futures, on a matter of principle. They are fighting the decision by management to sack 125 journalists and they are angry that Fairfax bosses have been enjoying pay rises while workers are being shown the door. And they will not be happy about this: the top four executives of Fairfax Media were secretly gifted $6.7 million in share options in a transaction which the company failed to disclose in its annual report. The sneaky pay deal involved half of a $13.4 million options package awarded by the board. The company’s last redundancy round was in April 2016 in which 120 employees either left or were fired. 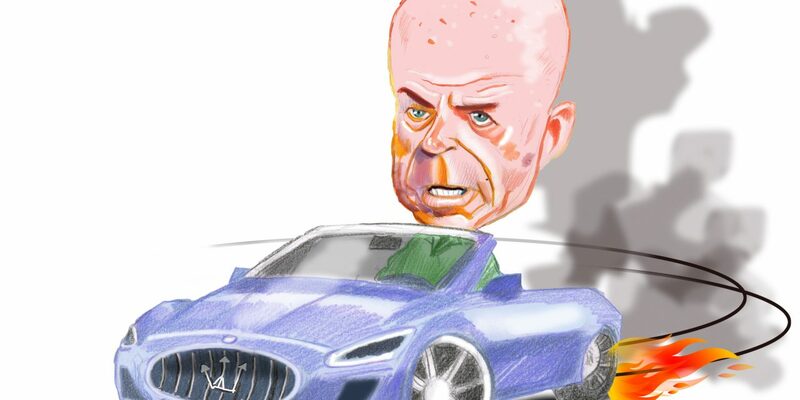 Two months later, at the end of June, a large tranche of executive options vested and Fairfax “cash-settled” them for chief executive Greg Hywood, general counsel Gail Hambly and chief financial officer David Housego. Only 15.25 million share options were disclosed however. Another 15.25 million “rights to options” were also cash-settled in favour of Hywood, Hambly and Housego but these were not disclosed in the annual report. Another executive, Allen Williams, formerly managing director of the Australian Metro Publishing business, was also a beneficiary. Share market sources told michaelwest.com.au the secret options deal was “underhanded”. Further, executives had “no skin in the game” in relation to the options as they never took equity in the company but the “notional” options, whose exercise hinged on the discretion of the board, were settled for cash. Chairman Nick Falloon was asked for comment but was unavailable. A spokesman for the company denied on Friday there was a failure of disclosure and responded by email that the deal was, “in the best interests of shareholders” (full questions and answers are at the bottom of the story). On August 30 last year a change of director’s interest notice was filed with the ASX for chief executive Greg Hywood. It revealed that Fairfax cash-settled 8 million options but did not include the other 8 million notional options. Cash proceeds were $5.6 million. Including Allen Williams’ entitlements, the options deal for the top four Fairfax executives was worth $13.4 million of which $6.7 million was not disclosed. When it comes to sly remuneration practices, Fairfax management has form. A few years ago, while working at Fairfax, we wrote a story exposing the board for paying its executives dividends on unvested stock. Along with executives in a handful of other companies, Fairfax managers were effectively benefiting from remuneration they had not earned. Striking journalists have expressed concern that, in sacking more journalists and reducing staff in the metro news division from 500 to 375, management was further abandoning its professed commitment to quality journalism. The aim of the latest redundancy round is to cut $30 million from a metro media cost base of $130 million. At the interim results in March, Fairfax disclosed it was cashflow positive (cash-flow for the half was $1 billion), was sitting on $118 million in cash and $147 million in long-term debt on a net asset base of $1 billion. It is not in bad shape, though if the weekday newspapers are closed the fall in ad revenue will entail further cost cuts. If fresh capital is raised in the partial spin-off of real estate classifieds business, Domain, it would bolster the group’s cash position (though an official decision on the sale is yet to be struck and management guidance is for a pro-rata allocation to existing shareholders). Last year, despite the sackings, chairman Nick Falloon and the company’s non-executive directors enjoyed a collective pay rise from $1.48 million to $1.64 million while disclosed pay for the top three executives rose from $4.8 million to $5.2 million. As for the secret options, they were neither disclosed nor expensed. The cash cost to shareholders of the 2014 allocation was $10.7 million. 1. Is it true that only half the options for Fairfax executives from financial years 2014, 2015 and 2016 were disclosed and expensed? 2. Why is it that only half of the 35.6m options held by three Fairfax executives from 2015 and 2016 appear in the company’s financial statements? 3. Why did the board elect to cash-settle the 15.25m options which vested after June 30, 2016, and also allow the 15.25 million notional options which were never issued to be cash-settled for $10.7 million? Spokesman: It was in the best interests of shareholders. 4. Do you agree that this amounts to a “secret pay package”? If not, why not? Spokesman: No. See answers 1, 2, 3. 5. Please explain how, in the present environment, Fairfax staff should not be upset at the rising pay of executives while deep staff cuts are taking place? Is the behaviour of the board and executive of Fairfax appropriate? All details relating to your questions were properly disclosed in the relevant remuneration reports to shareholders. Disclosure: this journalist was fired by Fairfax last year but does not deem himself to be a disaffected former employee.